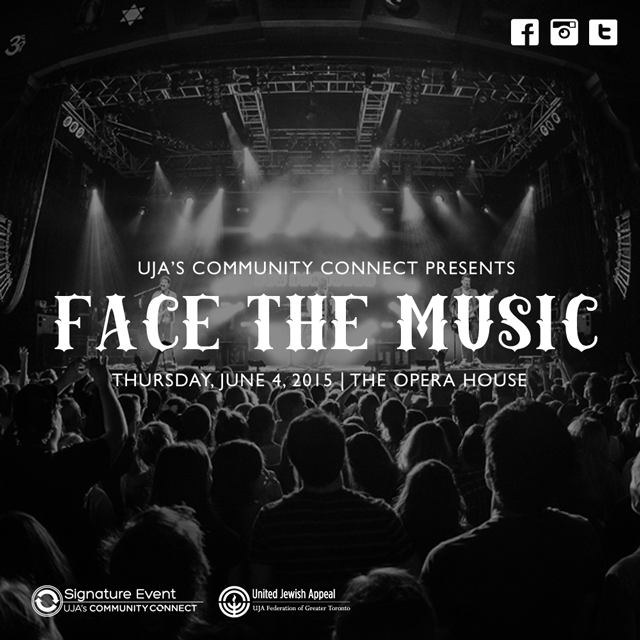 On Thursday, June 4, United Jewish Appeal of Greater Toronto’s Community Connect (COCO) will launch a new charity fundraiser called FACE THE MUSIC, made possible by the commitment and talents of an impressive cadre of COCO’s young volunteers. Proceeds from the event will be directed through United Jewish Appeal’s Annual Campaign to support summer camp scholarships for children in need. On the evening of June 4th at Toronto’s Opera House four chosen finalists from the GTA will compete for professional expertise and resources from a panel of judges who are also industry professionals. Artists who pique the judges’ interest could be offered recording time, marketing and promotional advice, PR services, vocal lessons, production value, equipment and more. UJA’s Community Connect empowers their peers to make a difference in our community and FACE THE MUSIC is a perfect example of what that means. For our community’s vulnerable who struggle to afford basic necessities, sending their children to summer camp is a luxury they cannot even consider. Through your support of FACE THE MUSIC, you will enable UJA to continue to make transformative differences in the lives of vulnerable children who will benefit from the incredible power of Jewish overnight and day camps. Take advantage of early bird pricing for $40 General Admission and $75 for VIP. VIP tickets are available for those desiring a truly unforgettable experience with an open bar pre-reception, premium hors d’oeuvres, and the opportunity to mingle with our world-class panel of judges. Get your tickets today, as prices will be going up on May 28!